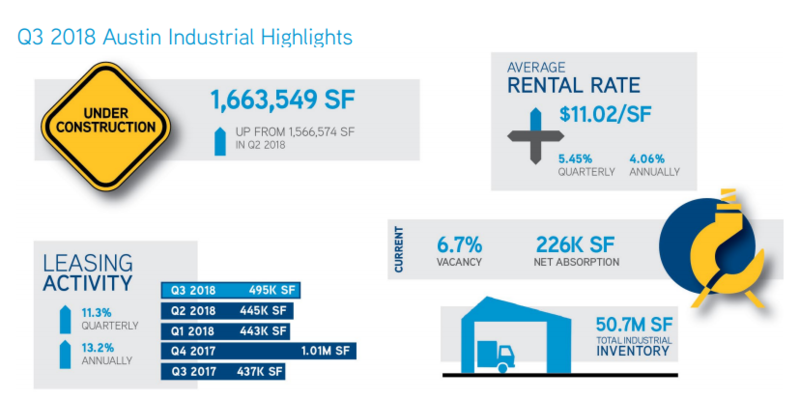 ​​​​AUSTIN – The local industrial market posted 226,753 sf of positive net absorption in third quarter 2018, according to Colliers International’s Austin Industrial Q3 2018 report. In all, over 1.6 million sf of industrial space was under construction ac​​​ross 20 projects. Four buildings delivered and four began construction. Citywide average rental rates did not fluctuate over the quarter and remained at $10.41 per sf.